Hello my sweet friends! How are you? We had a lovely (lazy) weekend as family. We went out for walks, did some cooking at home, watched some telly, played some games... Perfect! Hope your weekend was nice as well! Have you ever heard of "box of sunshine"? I came to this term a while back when I was browsing the internet. 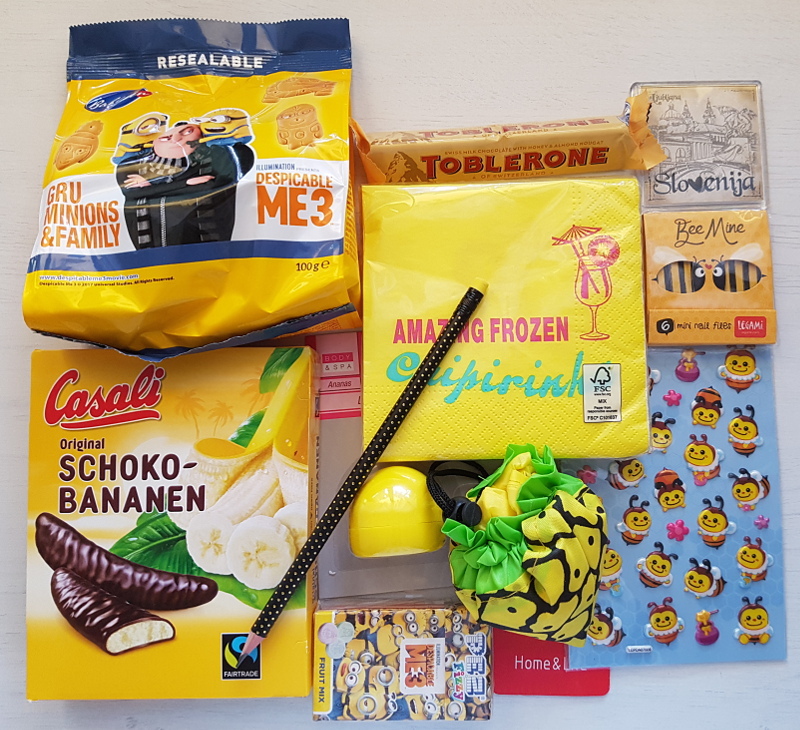 Basically it means that you take a box and fill it with lots of yellow things and send/give it to your friend/relative/penpal... I loved that idea so when one of my friends wasn't feeling well I just knew that I wanted to send one of those boxes to her. 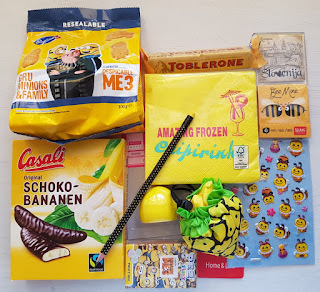 :) I tried to get many different yellow things that I thought she would like. Here's what I bought. I also bought her 2 wooden Gorjuss postcards (she collects postcards), but forgot to add them to the pile when I took the picture. Of course I also had to make a card to send it with the parcel. I sticked with the sunshine theme and made this CAS card. I didn't use any design paper, just yellow and white cardstock. White cardstock was embossed with Cuttlebug's embossing folder. I used googly eyes on the sun and drew the mouth by hand. Sentiment is a TGF stamp (Mini remix- Happy). I embellished the card with a few sequins.